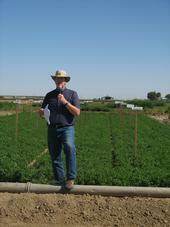 Dan Putnam discusses the importance of variety selection at an alfalfa field day. Mark your calendar for Thursday September 5th and plan to join fellow growers, PCAs, and seed and chemical company reps at our annual Alfalfa and Forage Field Day. Registration begins at 7:30 AM and trams will depart for the field portion of the meeting promptly at 7:50 AM. In the field, participants will learn about alfalfa variety selection as a tool for managing pests and diseases, using alfalfa-grains rotations to get the most from nitrogen fixation, and how Roundup Ready® and conventional alfalfa hay fields coexist. Three presentations covering nitrogen utilization, variety selection, and irrigation strategies for sorghum are also scheduled.